U.S. cheeses provide aroma, flavor and texture to many dishes around the globe. Whether standing alone or serving as an ingredient, a festive table isn’t complete without the delicious dairy delicacy. As explored in the December issue of Cuisine and Wine Asia, the foodservice industry has the opportunity to bring this at-home comfort to a dining experience with innovative menu items using cheese. The Unites States is home to cheese craftsmen who are not afraid to push boundaries. Instead of settling for traditional recipes, they expand on cheese’s four basic ingredients — milk, salt, rennet and cultures — to create new flavors using herbs, spices and rubs. For a menu refresh, foodservice professionals can create seasonal dishes by simply swapping cheese flavors with new, bolder offerings. The U.S. cheese industry has the capability to serve the global foodservice market as it accounts for 25% of the world’s cheese with more than 600 cheese varieties. On top of that, the United States increased cheese production by more than 1.4 million metric tons over the past decade, meaning menus have a reliable access to new cheese flavors as demand grows and competition strengthens. The expanding availability and varieties of U.S. cheeses provide a culinary twist to dishes that keep consumers coming back year-after-year. 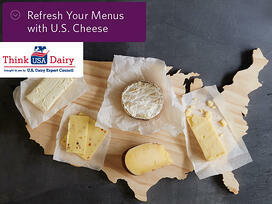 Let U.S. cheese be the hero on your menu whatever the season for flavors that warm and delight. Visit ThinkUSAdairy.org for more recipes and dairy resources.